VIDEO: Tornado forming about 1:30 p.m. on April 3, 2012 in Arlington, Texas, just north of Interstate 20 and U.S. 287. Multiple tornado warnings and tornado sightings were reported Tuesday afternoon south of Arlington, Texas. At least two videos were available early near Interstate 20 and U.S. Highway 287, which traverses the southwestern portion of the city. Video: Tornado forming near Interstate 20 and U.S. 287 on the southwest side of Arlington, Texas. The population in Arlington, Texas is about 365,438. Arlington is the third largest city of the Dallas-Fort Worth-Arlington Metropolitan Statistical Area, which is informally known as the Dallas/Fort Worth Metroplex or The Metroplex. Population of The Dallas-Fort Worth Metroplex is about 6,371,773 — the fourth largest metropolitan statistical area in the United States, following New York-Northern New Jersey-Long Island, Los Angeles-Long Beach-Santa Ana, and Chicago-Joliet-Naperville. 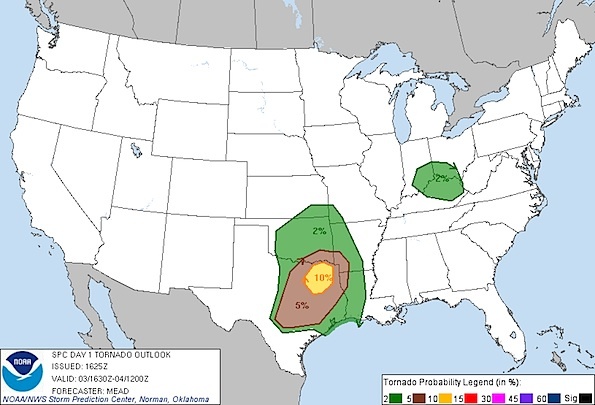 Tornado Probability map for the United States issued about 11:25 a.m. Tuesday, April 3, 2012.